Former Rangers player Andy Little is said to be in a stable condition in hospital. Northern Ireland striker Andy Little is being treated for a fractured skull following an accidental clash of heads in a training ground accident. The former Rangers and Preston North End player is said to be in a stable condition in hospital, according to his current club Stirling Albion. 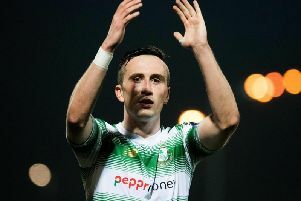 The 27-year-old, who won his ninth cap for Northern Ireland in 2012, was taken by ambulance to Forth Valley Royal Hospital before being transferred to another hospital in Edinburgh. Albion chairman Stuart Brown said: “His injuries are a fractured skull and eye socket. And clearly he faces a long journey to recovery. “I have been updated by the club medical staff that, whilst this was a serious and scary incident, and Andy’s injuries are substantial, he is now comfortable and stable in hospital and out of danger. “I spoke to Andy’s mum and she and his dad are making plans to travel to Scotland. “I have assured her that SAFC will do everything necessary to assist Andy back to full health,” he added. “I can’t thank our club doctor, Andrew Deeley, our physio Kenny Crichton and the paramedics enough for their swift and expert attention. Little made the move from Preston to the Scottish League Two club in February and has made five appearances since. He joined Preston from Rangers and spent time on loan at Blackpool and Accrington after failing to secure regular first-team football at Deepdale.